So I decided to get lost in Paris while listening to Kate Bornstein's A Queer and Pleasant Danger. It was a great time had by all! Travel Updated #11: Enjoying Paris to its Fullest! Paris has been fantastic! Here is my update of my excellent day yesterday, but for more details about my wanderings, check out my journal as you'll find out about my crepe adventure and soaking in all the sights--as well as my FAVORITE part of the Louvre! Another great day of adventuring in the Netherlands! Here's my latest video update, giving some of the numbers of my first week in the Netherlands. Enjoy the video, the pics, and the updates and let me know what you think. Travel Update #3: More videos, more pics, more fun! The trip continues to be an excellent success with lots of learning, laughs, and excitement. Below is my vlog update. Also, I wanted people to know, after 2-3 requests from readers that I have opened up the travel journal so that if people want to use the Comment feature, they can in the Google Doc to ask questions and comment about what you read there. I promise to answer them as best as possible. I arrived yesterday in Zwolle and it's Sunday morning, now. Here's my latest update. You can check out the two vlog posts, as well as my journal update, and current photos that I've taken. A truly multi-media update! So for those that don't know, from May 10 to May 30, I will be off to Europe for three weeks. For two weeks, I will be staying in Zwolle, Netherlands with a good friend and colleague. From there, I will be visiting Berlin for about 2 days, Paris for 3 days, and London for 2 days. I am (obviously) pretty excited about the trip and thought I would capture my travels through a mixture of blogging and video blogging. However, while I'll update here to let people know when I've updated my journal and my video travelogue, the content itself will not likely be stowed here. So below you can see my first update. 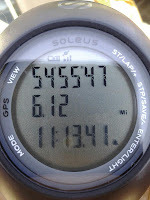 And you can keep up with my exploits by subscribe to My Channel. You can check out regularly updated travel journal below or click there to access it. I will be updating this blog with reminders of when I've updated the other resources. March - 32 BooksFebruary - 33 BooksJanuary - 33 BooksHighlights of the month--there were actually a couple that I found quite rewarding and insightful. My Word! 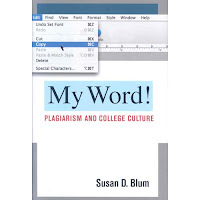 : Plagiarism and College Culture by Susan BlumThis should be required reading for any college-level instructor. Blum's accessible yet complex discussion sheds light on the slippery slope of what academic dishonesty consists of, how and why students are likely to commit it, and the challenges in addressing it. But more than anything, Blum vividly depicts the complexity of college culture that plays a central role in the development of cheating.